A large and impressive piece of Edwardian pine furniture. 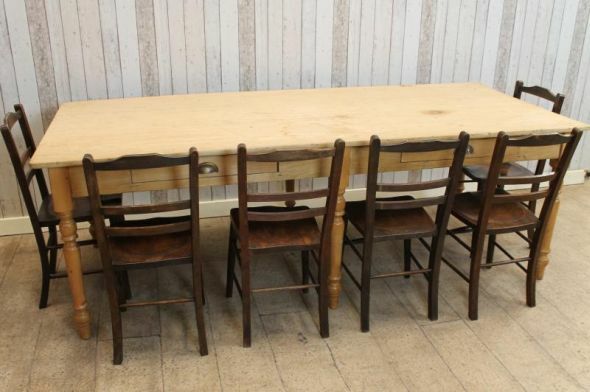 This traditional six legged scrub top table features six turned legs, two large cutlery drawers and original pine top. The table has recently been removed from a large farm clearance where it has been used on a daily basis. The table is in good condition for its age with all of the joints being nice and solid. It has two original drawers with metal cup handles; the drawer bases have been replaced at some point during its lifetime. The top is in an unfinished state, and would have been cleaned with hot soapy water. Please be aware that this is an old table, and will have marks and blemishes due to it being used on a daily basis. The chairs pictured are not included in the listing, but can be purchased separately. As you can see from the photographs, it will comfortably seat up to ten people making this an extremely useful piece of country farmhouse furniture.